This delicious gluten-free hamentaschen cookie is traditionally eaten on Purim (the Jewish holiday which happened on March 4th of 2015), one of the most exciting holidays on the Jewish calendar. 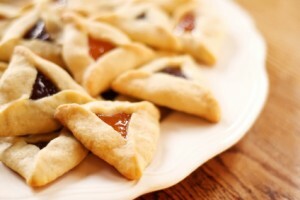 Hamentaschen is a filled-pocket cookie or pastry in a triangular shape. The shape is achieved by folding in the sides of a circular piece of dough with a chosen filling placed right in the center. It can have any number of different fillings including poppy seeds, caramel, cheese, prunes, nuts, dates, apricots, raspberries, apples, fruit preserves, cherries, chocolate, dulce de leche and even halvah. I love making cookies and a holiday does not mean you cannot make it any time of year, so I do this now and then. Three of my favorite fillings are berry preserves, sweet citrus flavor or a hazelnut chocolate (think Nutella with a caramel twist) – yum! This recipe provided by Lindsey Deitsch uses a 100% certified gluten-free baking mix from the company she founded: XO Baking Co., and the mix does not have grains. I do stay off of grains 99.9% of the time, except for the few times a year I may have rice or a gluten-free treat (with rice flour). Feel free to substitute the sugar in this recipe with a cup for cup sugar-free paleo-friendly sugar substitute for less carbs, and less sugar impact. If you enjoy this one, be sure to also check out her other stellar recipe contributions: lemon bars and lemon cake! 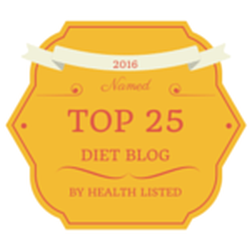 I use erythritol,zensweet, luo han guo, and sometimes I need a tad of stevia to balance the flavors. It is a little balancing act at times. I am forever tasting my doughs, and am known for that in my kitchen…:-) Have fun and let me know how this recipe turns out for you! This delicious gluten-free hamentaschen cookie is traditionally eaten on Purim (the Jewish holiday which happened on March 4th of 2015), one of the most exciting holidays on the Jewish calendar. It can have any number of different fillings including poppy seeds, caramel, cheese, prunes, nuts, dates, apricots, raspberries, apples, fruit preserves, cherries, chocolate, dulce de leche and even halvah. Delicious! OPTIONAL: filling of choice - poppy seeds, caramel, cheese, prunes, nuts, dates, apricots, raspberries, apples, fruit preserves, cherries, chocolate, dulce de leche, halvah or anything else you desire. In a large mixing bowl with an electric mixer, cream together the sugar and softened butter, until smooth. Add eggs, vanilla, juice and zest and continue mixing until combined. Add flour and baking powder and continue mixing until a smooth dough forms. Dough will be a little sticky. Divide dough in half and wrap each section in plastic wrap. Preheat oven to 350F degrees and line a cookie sheet with parchment paper. Remove half the dough from the fridge and roll out onto a lightly floured surface ⅛”-1/4″ thick. You may need to dust the whole dough with a little flour if it’s too sticky. Cut dough into circles, using 3” or 4″ round cookie cutters. Using a teaspoon, place desired filling into the center of each round. Form a triangle with the dough, by folding and pinching each side. Repeat the same procedure with the other half of the dough. Place cookies onto sheet and bake for 20-25 minutes until lightly golden.